You've heard many times of Hitler's "NEW WORLD ORDER," - but do you know exactly what it is? Few realize the amazing nature of it - that it is a diabolical counterfeit, in reverse, of the prophesied new world order of Almighty God, soon to be set up on earth! 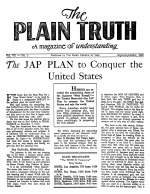 This article appeared first in the May-June 1941 number of The PLAIN TRUTH. But since the United States has entered the war it takes on new significance. So partly for the benefit of the thousands of new readers of The PLAIN TRUTH we reprint, in slightly abbreviated from this amazing article. The astonishing facts revealed in this article are the result of careful and painstaking research, and are based upon Hitler's book, "Mein Kampf," and authentic reports from leading European correspondents, and are believed to be accurate and reliable - the more so in view of the striking comparison, in every detail, by contrast, with the New World Order of Bible prophecy!